I attended this show during the past weekend and although it’s been my first show, I think it was a great success. The show consisted mainly out of Tourist Accommodation and –activity exhibitions, the different regions of the Western- and Eastern Cape were represented at different stands, from West Coast, Cape Winelands, Cape Agulhas, Gardenroute, Oudtshoorn, Tsitsikamma and the Eastern Cape all had some appealing and colourful displays. There were also camping gear stalls, like Cape Union Mart and a variety of food stalls. 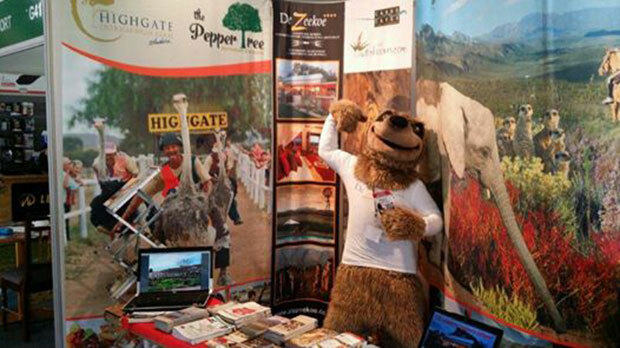 We shared a stand with the Oudtshoorn tourism buro. Beautiful banners were printed with pictures of our variety of activities as well as our accommodation facilities. We also had our Meerkat mascot “patrolling” the terrain and attracting people to our stand to learn more about what we have to offer. My aim was to gather new clients as well new tour operators and provide them with a power point presentation filled with colourful photos and information about our accommodation and the Klein Karoo region. I also had the opportunity to network with representatives from the other regions’ stands and learn more about what they have to offer to tourists as well. There were over 40 000 people that entered throughout the weekend. The farm where the show was held, Lourensford Estate at the foot of the Helderberg mountain in Somerset West, is a massive 4000 hectares, producing their own wine, as well as apples, pears and plums for export purposes. The weather was perfect and we couldn’t have asked for better.